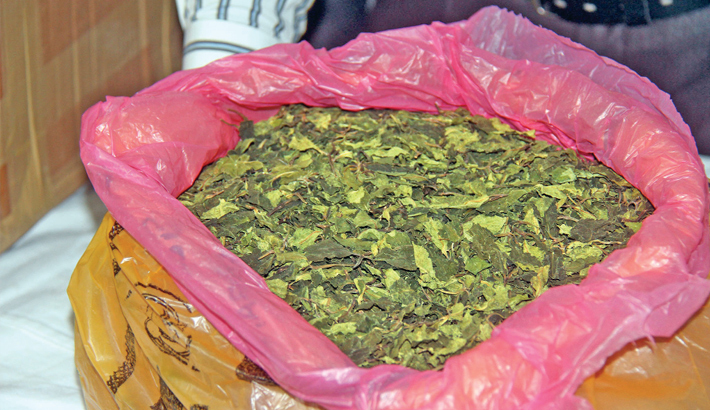 Criminal Investigation Department (CID) has recovered 1,600 kilograms of Khat, a new psychoactive substance (NPS) drug, worth about Tk 2.37 crore from GPO Foreign Parcel branch in the capital. A team of Serious Crime Squad under Organised Crime unit of CID recovered 96 cartons containing the substance on Sunday, -- the third haul of the drug. Razib Farhan, additional superintendent of police, led the drive as per the directive of Syeda Jannat Ara, special superintendent of police, at Organised Crime (Homicidal and Serious), CID. Md Shah Alam, deputy inspector general (special investigation and intelligence) of CID, disclosed this at a press briefing at CID headquarters on Tuesday morning. The DIG said the consignment was sent to 20 importers and firms from Ethiopia. One of such firms is Esha Enterprise at house no. 28, road no. 2, block no B, in Badaldi under Turag. The drug was sent from Muluken Ayalew, Assefa, Addis Ababa, Ethiopia. The DIG did not disclose the names of 19 other importers and firms but said that all those involved in import of the drug would be brought to book. A case was filed with Paltan police station in this connection on Monday. The recovered subsistence is leaf which is used for producing drug like Yaba. Earlier on August 31 and September 8, 460kg and 160kg consignments of similar substance were seized by the customs officials.